Officials at the groundbreaking ceremony, Wednesday. 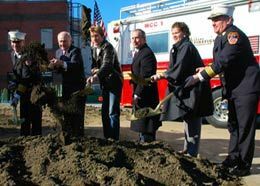 The city said that since 2004, more than $60 million has been dedicated to improving the Fire Academy facilities. Last year, two firefighters died in an August blaze at the former Deutsche Bank building, a condemned 41-story skyscraper. And in the 2001 terrorist attacks, 343 firefighters were killed in the collapse of the World Trade Center, whose twin towers stood 110 stories. At the former Deutsche Bank building, a new fire suppression system will be able to detect a breach in the standpipe, officials said Wednesday. The standpipe, which supplies water to fire hoses, was broken when the fire occurred.